Today, Prime Minister Justin Trudeau is slated to deliver an official apology for the Canadian government’s role in turning back the MS St. Louis. 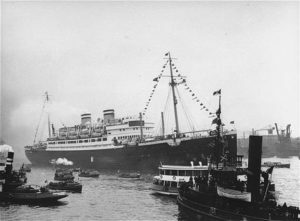 The ship, which was carrying over 900 Jewish refugees, attempted to dock in Halifax in 1939 before it was turned away by Canadian immigration officials. Over 250 of the ship’s passengers were later murdered in Nazi death camps in Germany. The decision by Canadian officials to refuse entry to Jewish refugees fleeing Nazi Europe reflects the antisemitic and xenophobic bigotry shaping Canadian immigration policies at the time, which saw the admission of fewer than 5,000 Jewish refugees between 1933 and 1945. Such policies can be succinctly described with the refrain from a Canadian immigration official who, when asked how many Jewish refugees would be admitted after the war infamously replied, “none is too many”. While Trudeau’s apology is a welcome step towards righting a historic wrong, such words ring hollow in light of Canada’s continued harmful practices toward migrants, refugees and asylum seekers and its active role in perpetuating mass forced migration in the first place. This apology comes within a week of an announcement by the Canadian Border Services Agency (CBSA) of plans to substantially increase deportations of migrants by 25-35%. IJV is dismayed that the Liberal government would apologize for wrongs committed in the past, yet commit to increasing such practices today, many of which have resulted in torture and sometimes death in recent years. Within the Jewish Tradition, there is a concept called T’shuvah, or “making amends”. This concept is prefaced on the immediate halting of the harmful action followed by concrete, tangible steps to rectify it, including a steadfast commitment not to repeat such harms in the future. For Trudeau’s apology to be meaningful, he must commit to ending the ongoing detention of migrants, that sees thousands of people — including children — jailed in immigrant detention centers each year, at times indefinitely, on stolen Indigenous land. He must commit to ending the exploitation of migrant workers, subject to horrendous working conditions and often abuse at the hands of their employers, with few options for legal recourse. He must commit to rescinding the Safe Third Country Agreement, an outdated policy that denies migrants the right to asylum in Canada if their first point of entry was through the United States. He must commit to making sure that “never again” truly comes to mean never again for anyone. Today, we are thinking of those 254 Jewish refugees murdered by the Nazis after the Canadian government denied them asylum. We are thinking of the 11 Jewish worshippers in Pittsburgh who were murdered for being Jewish, in part because of Hebrew Immigrant Aid Society’s support for immigrants and refugees. We are thinking of the over 5,000 migrants who died or went missing around the world in 2017 alone as they attempted to cross colonially-imposed borders. May all of their memories be for a blessing. We are grateful for the tireless work of migrant justice organizations including, No One Is Illegal, Solidarity Across Borders, Justice for Migrant Workers, Canadian Council for Refugees and the Sanctuary City Movement, who organize around the principles of justice and dignity for all, all the while working in active solidarity with Indigenous Nations who remain the original stewards of these lands since time immemorial. As white supremacy, fascism and xenophobia are on the rise across North America, it is incumbent upon all of us to welcome immigrants and refugees around the world seeking sanctuary with open arms. It is not enough for Trudeau to apologize; he must stop actively perpetuating such harms.